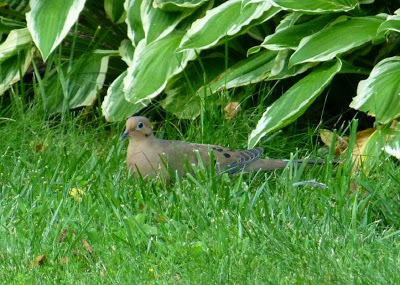 As we head into cool weather, among the bird species that we can count on to see us through the wintertime is the Mourning Dove, so we’ve chosen this lovely bird as our November feature in our 12 Months of Birding at the Inn series on the blog. A year-round resident in Pisgah National Forest surrounding the Inn on Mill Creek, the Mourning Dove is a large brown dove with a long, pointed tail. Its head is a bit small compared to the rest of its body. Its call is a soft coo-coo-coo that makes the Mourning Dove sound very melancholy. At the Inn on Mill Creek (a site on the North Carolina Birding Trail, Mountains Region), you can often spot several Mourning Doves bobbing around at the base of the birdfeeders, foraging for seeds. On occasion, one or two will be perched on branches observing everything like a couple of busy bodies who have met up for the afternoon to sit a spell and chat over lunch. And it’s a big lunch: According to the Cornell Lab of Ornithology, a Mourning Dove eats about 12 to 20 percent of its body weight per day and can store a large amount of seeds in its esophagus for digesting later. Mourning Doves at the Inn will take off very quickly when they see people approach. They fly very, very fast and their wings actually make a high-pitched whistling noise when they fly. But if you stand still outside at the Inn or if you watch from the dining solarium windows or from other places indoors, it doesn’t take them long to make it back under the birdfeeders for more snacks.